Silence, tranquility, clean sea breeze and green trees are characteristic about this neighborhood. All this is just 5 kilometers from the downtown of Varna and 4 kilometers from the sunny beach of the Saints Constantine and Elena Resort. In the hotel's complex you have the chance to take a rest from the tiresome week, to have splendid holiday or just to kick back. 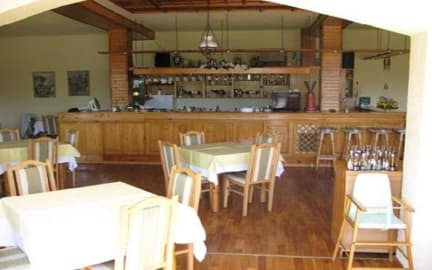 The hotel and its services are suitable for any type of activities - from business trips, to hunting and tourism. 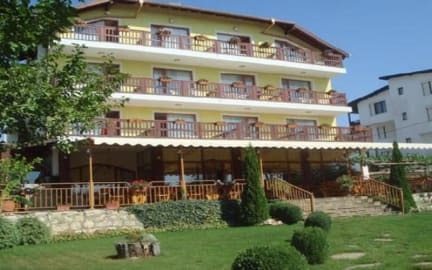 The fact that the hotel is near Varna and resorts and beaches in area boosts the good mood of our guests and doesn't disturb their good, healthy sleep and the discreet atmosphere we provide. The hotel is rated 3 stars and has 12 double-bed rooms. Each bedroom has its own tiled bathroom with a shower, hair dryers, fluffy towels and toiletries. Each bedroom also has a balcony, satellite TV, mini-bar and a phone. You will be surprised by the size of the rooms which have an additional bed and great view towards the sea. The restaurant has 50 seats indoors plus 38 seats outdoors in the garden. The silence and the quietness are characteristic of the area. They perfectly accommodate you with the high-class cookery of Master Angel the good mood is accompanied by the professional service and the attention from the stuff.